Next week, I will embark on one of my favorite weeks of the year. My husband Rolfe and I and many other Rotarians in our district will leave for Jamaica on a Medical and Dental Mission trip. This year will showcase the 20th Anniversary of this mission as it continues to serve others. 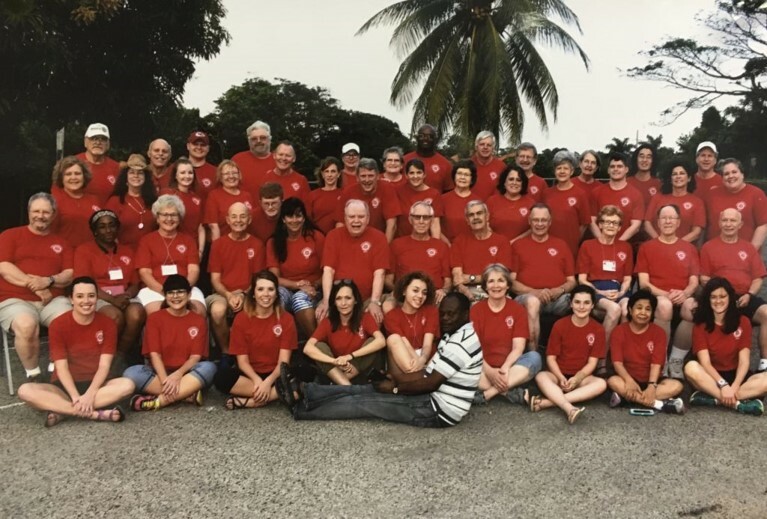 The Jamaica Medical/Dental Mission group is sponsored by Northminster Presbyterian Church as well as a number of Rotary Clubs in District 6040 in an annual humanitarian health mission. Each year, between 40 and 50 volunteers spend 10 days in Jamaica and operate 3 clinics per day for 5 days. It started as a hope and dream in 1999. That was Dr. Bob McGee’s (North KC Rotarian) first year to go to Jamaica. From that beginning point, the desire and goal was to focus on humanitarian services which would benefit the Jamaican people and improve the lives and future of many of the patients in rural areas. Our goal is to serve in some way at least 2,500 patients in our clinics each year. After this years trip, we will have brought medical services to more than 50,000 patients, given out $1.5 million in medicines to the patients we serve. Our mission is to build bridges of friendship and love through health services. We call it love in action through service. This year’s team is made up of 4 doctors and a nurse practitioner, 2 eye doctors, 5 dentists, 6 nurses, 2 pharmacists, 2 teachers, 3 pastors and a wonderful support staff. We have 5 staff who are young people. Our desire is to make a difference in every adult, child or grandchild and hope that we may change their lives for the better forever in the name of service. Thank you Dr. Bob McGee for your insight and service to others for 20 years! 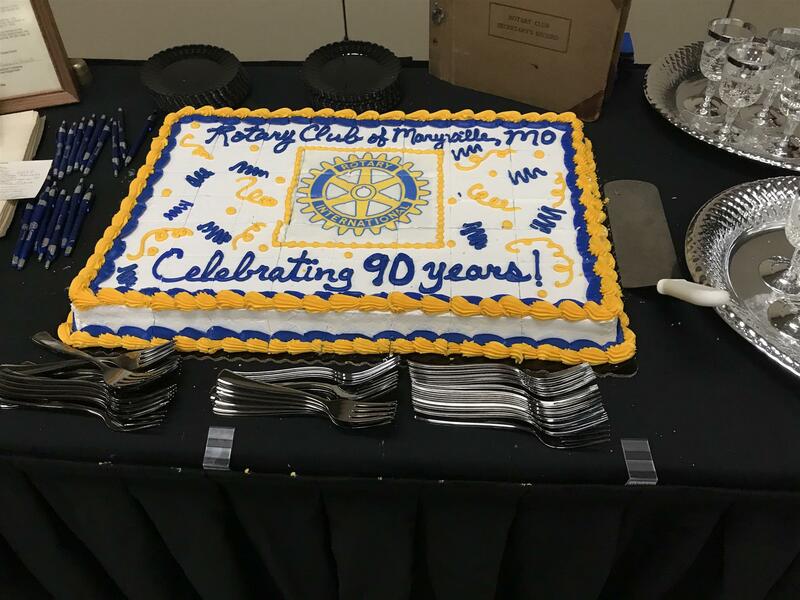 Maryville Rotary Club celebrated its 90th anniversary with a holiday party at the Mozingo Lake Conference Center on November 28. The event featured dinner, length of service awards, an honory Paul Harris Fellow presentation, and a toast from District governor Julie McCoy . Each year the Rotary Clubs of District 6040 hold this contest for area students to complete for cash prizes. From the earliest days of the organization, Rotarians were concerned with promoting high ethical standards in their professional lives. One of the world's most widely printed and quoted statements of business ethics is the 4-Way Test, which was created in 1932 by Rotarian Herbert J. Taylor, when he was asked to take charge of a company that was facing bankruptcy. This 24-word test for employees to follow in their business and professional lives became the guide for sales, production, advertising, and all relations with dealers and customers, and the survival of the company is credited to this simple philosophy. Adopted by Rotary in 1943, the 4-Way Test has been translated into more than a hundred languages and published in thousands of ways. Every three years, Rotarians from around the world meet at the Council on Legislation to review and vote on proposed changes to the legislation that governs Rotary. This body, represented by one elected Rotarian from each district, meets to consider enactments which change Rotary’s governing documents; The Rotary Constitution, Rotary By-Laws and the Standard Rotary Club Constitution. I have the honor of representing District 6040 at the 2019 Council meeting in Chicago on April 14-18. Along with 535 colleagues from around the world, we will debate and vote on 116 proposed enactments which have been submitted from Rotary Clubs and districts, including 2 submissions from District 6040. You can follow the Council’s progress and voting results on the Rotary website. The Rotary Club of Blue Springs helped their local school district become trauma sensitive. 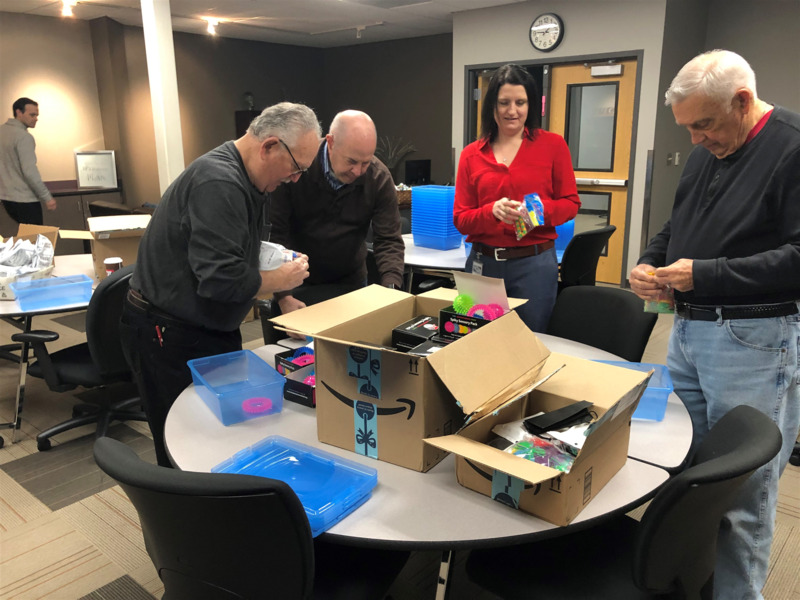 They brought books and posters for counselors and made tool kits with fidget and stress relieving gadgets for the middle and high school students. Fifteen years ago, RYLA expanded its framework to become the tri-district Missouri RYLA Academy. High school students from Districts 6040, 6060, and 6080 come together each summer to spend four days on the William Woods University campus in Fulton, Missouri. Because of the program’s outstanding curriculum and achievement, the academy now offers two sessions each summer, capable of hosting 100 students per session. Considered the Rotary International model service leadership development curriculum for high school aged participants, students dive deep into learning about Rotary and the power of service above self. Members of the Weston Rotary Club and other members of the community are working with the City of Weston in hopes of establishing an annual event recognizing Ben Holladay. But unless you are a resident of Weston, Missouri or a history buff of the Old West, chances are you may have never heard of Ben Holladay. For Visitors to Weston or for those who grew up in the area, Ben Holladay is known as “The Stagecoach King”; founder of the local distillery in 1856; owner of the fabulous three-story International Hotel opened in Weston in 1858, but burnt down during the American Civil War. The site is now the location of the Weston Historical Museum. Other than these locally promoted facts on Holladay, very few people in the region know the complete story of this truly historic and iconic individual or the fact he was a resident of Weston for approximately 20 years before becoming famous and moving on. The local group is hopeful in establishing an annual event honoring Ben Holladay, starting as early as April of 2020. Travelers to Weston always seem to find one reason or another to visit the historic Rivertown, but they are hopeful this new event will attract additional visitors to the city.